Saturday’s match is being played outside World Rugby’s international window so both Scotland and Wales will be unable to select their overseas-based players. The window restrictions mean Townsend’s team is effectively an Edinburgh-Glasgow select side. Only four players who featured in the defeat of the Pumas are retained, with McInally joined by Edinburgh front-rower Allan Dell, while Glasgow out-half Adam Hastings — the son of Scotland great Gavin — and fullback Blair Kinghorn also retain their places. But there is plenty of experience throughout the Scotland side with five Glasgow backs — wingers Tommy Seymour, Lee Jones, centres Huw Jones and Alex Dunbar, and scrum-half Ali Price all returning to the line-up. 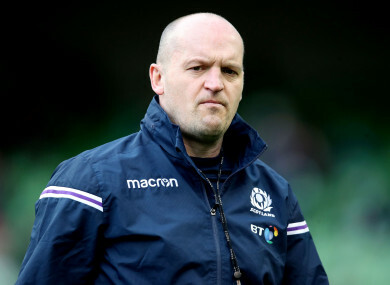 “As always we expect a very tough Test match against Wales in Cardiff — a contest that will be physically and technically demanding in a noisy arena,” said former Scotland playmaker Townsend. Scotland will be looking for their first win in Cardiff since 2002 — when Townsend was at out-half for a 27-22 victory — in a fixture that has proved controversial. Traditionally, November internationals in Europe have pitted the host nation against a southern hemisphere team. Critics have accused the Welsh Rugby Union (WRU) and their Scottish counterparts of devaluing their annual Six Nations clash — the only time the teams involved usually meet in a year, unless they are facing each other in World Cup competition or warm-ups for the global showpiece. There were also complaints that spectators had been led into thinking a portion of their ticket money for the Doddie Weir Cup fixture would go towards raising money for the charity of the former Scotland lock, who is suffering from Motor Neurone Disease. Initially both unions said the fixture was designed to “raise awareness” of MND, but on Monday, following a public outcry, both the WRU and Scottish Rugby Union announced they would donate a joint six-figure sum “directly from the proceeds of Saturday’s fixture” to the My Name’s Doddie Foundation. Wales, who beat Scotland 34-7 in this year’s Six Nations in Cardiff, were due to name their side on Thursday. Email “Scotland without Laidlaw as Cardiff clash falls outside international window ”. Feedback on “Scotland without Laidlaw as Cardiff clash falls outside international window ”.